My holiday wreaths are traditional only in that they use local materials, and my definition of local involves my grown children, hundreds of miles away where I have picking privileges. No ribbon on this one either; evergreens from daughter Jen's place in rural NH. Birch bark from son Mike's place also in rural NH. Osage Orange slices from my favorite tree in Riverside Park, dried in my NYC oven. I adorned The Lost Mitten Wreath with stuffed mittens and gloves, toys, and clumps of saved yarn from another project, in the right color tones of course. Fresh greens from Jen's again. 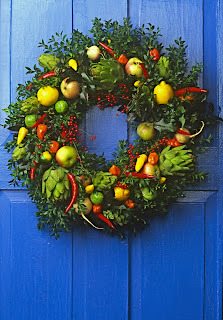 And when you have no greens, do as Angela Chandler did for the Central Park Arsenal Wreath Show. She found a great use for the ubiquitous hangers from the dry cleaners. Fantastic! Below, not a constructed wreath on wire but a simple placement of fresh greens, birch bark, cones and dried Osage orange slices enhance this corn/cranberry relish; it's mostly stuff left over from other wreaths. As author of The Ultimate Wreath Book, Rodale Press, 1995, I was well aware of my influences when I created this collage for my new book, Artful Collage from Found Objects, Stackpole Books, 2012. I called it The Crown Jewels because it seemed like an ancient royal necklace, although it was constructed with locust pods, acorns and cones found on city streets. A little gold and copper spray paint helps. So I guess this is the Ultimate Wreath Collage. From one wreath maker to another:pretty cool!! 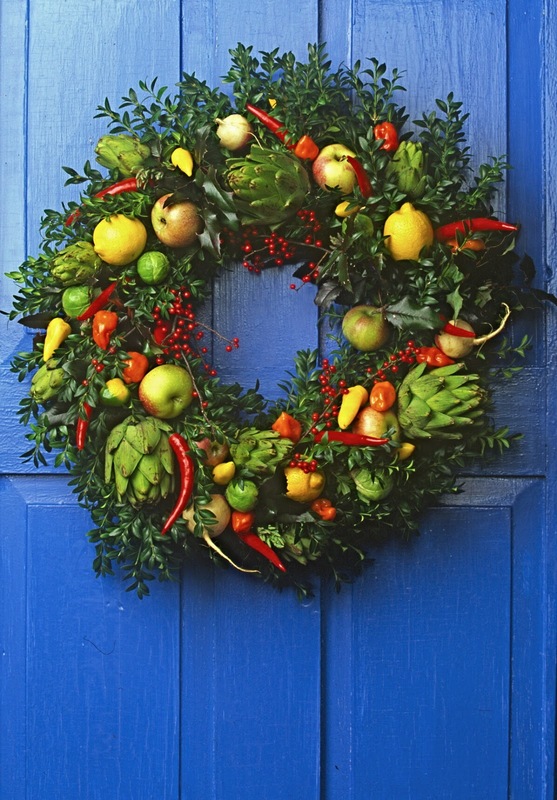 I love holiday wreaths for any time of the year. 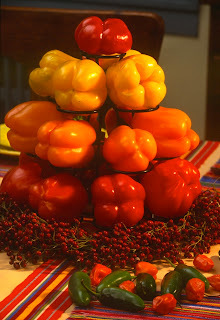 I like the pepper pile!